Browse: Home / CTB-Locker Ransomware Scripts. NOTE: This Post for Education Purpose and Reverse Engineering Trainer session Only! CTB-locker is a encryption malware belongs to a new generation of ransomware family. + ctb_help.py; CTB-locker infection helper tool PoC. Proof-of-Concept tool for helping in recovery/decryption of files encrypted using the ‘CTB-locker’ ransomware family. Run this script on the infected machine. + ctb_memhunter.py; CTB-locker memory hunter tool PoC. Proof-of-Concept tool for detecting remnant Curve25519 keypairs in ‘CTB-locker’ ransomware family memory dumps. + ctb_recover.py; CTB-locker file decryption tool PoC. 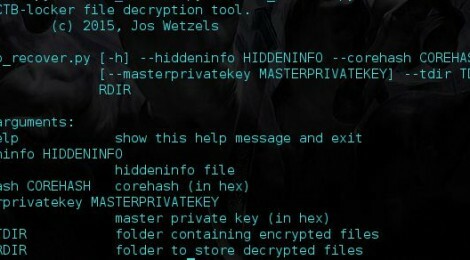 Proof-of-Concept tool for decryption of files encrypted using the ‘CTB-locker’ ransomware family provided we have the master private key. ← CrackMapExec v-2.0 codename; ‘I gotta change the name of this thing’ released.